“You guys should write a travel book for us,” said the head of partnerships at National Geographic Books. Our jaws dropped in unison. “No one else has honeymooned as extensively, and if anyone knows about couples travel…it’s you two.” As flattering as that was, he couldn’t have been serious…this was writing for National Geographic, the holy grail of publishing. This is where Jane Goodall and Buzz Aldrin publish their books, not travel bloggers. He continued, “We have never done a guide on couples adventure travel, so it could be a perfect fit. Let me pitch it to the rest of the team and we’ll see how it goes.” Twenty-nine months, dozens of meetings, ten PowerPoints, two sample chapters, and countless prayers later, we inked a book deal with National Geographic. Now we had to step up to the plate and write the Ultimate Journeys for Two: Extraordinary Destinations on Every Continent. This was a massive opportunity, not just to become Nat Geo authors but to inspire other couples to break out of their comfort zones, heighten their senses, see the good in the world, and grow closer from experiences that only travel can offer. We had the chance to share the places that have touched our souls and expanded our definition of beauty and happiness, the places that have humbled us and made us better people. Though how to cull down five years and nearly 500 places worth of travel–and in what order? We decided to organize our favorite places by type of destination (deserts, beaches, mountains, etc.) so people can discover trips based on their interests, not a country index (because people rarely flip to Bolivia and Myanmar). We’ve tried to capture the essence of each region and the experiences that make it shine. Exploring without an itinerary, getting local, travel hacking, and finding the perfect mix of high and low is what makes us tick as travelers. So in addition to “When to Go” and “Where to Stay,” each destination has a “Get Romantic” and a “HoneyTrek Tip.” We want couples to see the romance in adventure, like hiking to a waterfall with natural infinity pools or riding a snow cat to a candlelit dinner in a yurt. We want you to splash out where it counts and see that “going budget” can sometimes lead to richer experiences. No-holds-barred, we’re sharing our best road-tested advice and secrets for unforgettable travel. Think we’re a little nuts for traveling the world together 24/7? Well, we are not the only ones doing it and wanted to share the inspiring stories and insights from other intrepid couples. In each of the 11 chapters, we feature a “Power Couple,” friends and mentors across ages, nationalities, and travel styles, that have done everything from road trip across six continents to sail the seven seas. We’ve asked each duo to reveal their absolute favorite place in the world, top experiences, and tips for staying sane and in love on the road. We are so proud to announce these guest contributors and travel blogging powerhouses (from left to right): The Travel Manuel, Divergent Travelers, Green Global Travel, Hecktic Travels, The Planet D, 2People1Life, Sailing La Vagabonde, Bruised Passports, Uncornered Market, Travel Past 50, and Nat n’ Jodie. Their hard work and wisdom make this book that much better! As for working with National Geographic, they live up to their good name and we have been humbled to collaborate with them on every level. We were kind of assuming this award-winning team would rewrite half our words and pull the bulk of the photos from their coveted archives, but no. With their guidance and support, they let us flex our creative muscles and encouraged us to share the personal side of our journey—even the ridiculous and dicey stuff! Pictures of us Peruvian folk dancing (while drinking moonshine), stories of us hitchhiking on top of banana trucks, and getting slingshot lessons from a Burmese grandma…this isn’t your average guidebook. Nat Geo let us tell it like it is and have fun doing it. That said, it wasn’t easy. We spent nine SOLID months researching, writing, rewriting, editing photos, tweaking layouts, and giving it our all. For the first time in over five years, we had to sit at a desk and work 16-hour days—a true challenge for anyone, let alone nomads. To feed our travel addiction and remain disciplined, we decided to switch up our office each month with a housesit or Airbnb in a new country, including Mexico, Costa Rica, Nicaragua, United States, Portugal, Spain, Hungary, and Croatia. Having a home in an exotic locale gave us the stability and the inspiration we needed, plus it got us hooked on one of our favorite styles of local travel! The day we turned in our 272 pages of text and 325 photos, we weren’t sure whether to throw the biggest party or take the longest nap. Glad we got in both because we still had a long road ahead. Editing and expanding text to fit the layout, triple fact-checking, unearthing our highest resolution photo files, and taking a fine-tooth comb to every line, this is what it takes to submit a manuscript for print. Unlike the internet world where errors can be fixed at any time, great book publishing demands perfection—especially at National Geographic and their distributor Penguin Random House. We have since developed an even greater respect for authors, editors, and the craft of publishing. It’s this level of meticulousness that nearly killed us, but the reason why their books are among the most respected in the world. In typical HoneyTrek fashion, turning in our final manuscript with all our hand-written changes, ended in a heart-pumping adventure. We got to the UPS store 40 minutes before the last pickup, and figured this was ample time to write a thank you note to our editors, wait in line, and pay for overnight shipping (the hard deadline was the next business day). We reached the front of the line and the UPS attendant said, “Oh, the driver came 15 minutes early today, didn’t you see her leave?” I literally felt nauseous at the thought of nine months of work being jeopardized over the difference of a few minutes. Mike sprung into action and pleaded with them to find the driver’s whereabouts, and the attendant replied, “She’s heading east on Sunset and is about a half mile from her final pickup.” We sprinted to the car and Michael “Andretti” Howard put the pedal to the metal. Weaving in and out of lanes and dodging pedestrians, we spotted the UPS store in the distance and the driver hopping back in her truck. Mike unlocked my door, “Run it!” Gripping the manuscript in one fist and pumping the other for speed, I ran across six-lanes of traffic and threw myself, not just in front of, but inside the truck. I probably could have been arrested for trespassing, but I was not letting this shipment leave without our book. “Can you please make sure this arrives in Washington DC by Monday morning? This is our book for National Geographic,” I said with pride and desperation. “Oh wow, National Geographic,” she said. “I will do my very best.” I literally hugged this UPS employee. The book was out of our hands and I stood on the corner helplessly smiling and waving until the truck was out of sight. The manuscript reached DC on time, and it has been sent to the printer for the first run of 25,000 copies. 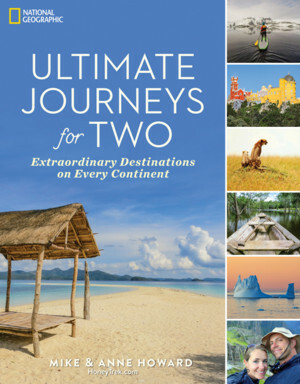 Ultimate Journeys for Two is releasing in every major book store across North America and wherever English books are sold on September 5, 2017, though it’s actually available for pre-order right now on Amazon.com and BarnesandNoble.com. Early sales help determine the success of the book, so just sayin’ … if you need ideas for a romantic getaway or have a few travel-happy couples in your life, why not get that holiday shopping started! With the help and support of many family, friends, and co-workers, we have no doubt or shame when we say, this book is pretty darn awesome and we know you’ll love it too. Oh my gosh this is so exciting you guys! I can’t believe your dramatic finale running after the UPS driver! How intense! The two of you are such an inspiration, and proof that hard work pays off! Also, we love the sneak peek into the book! We better get a copy! So exciting! You two worked very hard and you deserve the rewards from this. Hope it is substantial! I’m happy that my house in Mazatlan was a part of the journey! I’m so looking forward to the book since I’m sure it’ll be a great read. I hope you’re doing book signings or other promotional events because I’d love to attend one. You’ll definitely get a kick out of it–especially since you’ve been following along for years! We’ll definitely be doing an event in NYC and would LOVE for you to come! Congrats on the book. I love all your pictures. I think that I will get a copy and have it with us as we travel that way we can enjoy some of the places you recommend. Such a great accompplisment. you should be proud of yourselves. A good book with great content for a great price. Buying my copy soon. Congratulations! What an accomplishment. Not only are you living a dream life, but sharing it with others. That is so cool. I’ll be looking for more info on this book,a nd if you are doing a tour in our area to promote it. Wow!! Congratulations this is such an incredible achievement! As if the whole process wasn’t stressful enough it sounds like the book delivery was just as action packed! So glad you were able to find the driver and get it there on time, talk about creativity! Best of luck on the first 25,000 copies! Wow, how awesome and Congrats! I would love to read this, I just might reserve my copy. So happy for you both. How wonderful! Congratulations on your success. I especially like that you featured other “Power Couples” that travel. We aspire to someday write a book or two on our travels. We’ll be keeping our eyes open for your book. Thanks Sue! So important for couples to get out there and have adventures together…that’s what this book is all about! Happy travels and thanks for your support! Oh, what adventures you’ve had. I personally enjoyed hearing about your writing places. I love to write and having all those places of inspiration would be awesome. Travel offers plenty of writing inspiration, as you know! 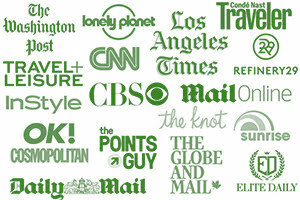 Great you travel write as well, keep it up and thanks for your kind words! It is dream for us too…one where we are still pinching ourselves. Thanks, Kristina! Wow! What an amazing opportunity! This is very inspiring, my hubby and I love to travel and we’ve visited about 6 places so far. Some with and some without the kids. Love the finishing touches photo! I can only imagine how much work goes into such a project but this has to be so rewarding! This is fantastic news! I had a hunch something was in the works but this is beyond expectations. ‘Great approach – organizing the book by ‘region’! ‘Looking forward to the arrival of our copy. Ken, we really appreciate your note! You’ve been a great support over the years. We think you’ll have fun strolling memory lane and find some new surprises when you read the book! Wow! This is wonderful news. Congratulations guys. Great work. I’m sure that you are both so proud as The National Geographic is the height of travel expertise. Thank you, we’re feeling quite proud and humbled all at once. Trying our best to do them justice! Congratulations from the entire family! Well done, and we all are very Proud of your numerous accomplishments. Hope to see you two on your National Geographic “Ultimate Journey for Two” book tour. Thank you for taking us on such wonderful world-wide travel adventures! wow, you really are lovely and a huge congrats.. absolutely deserving! Congrats! It sounds like a really interesting book and can’t wait to read. It sounds like it was a lot of hard work but it’s cool you kept traveling with long stays in different places. All the best for the first 50k copies guys. Too happy for you guys. Congratulations to you both, keep shining. Thanks so much, Rahul! Really appreciate your support! That’s awesome, Cally! So many inspiring couples out there, glad we could make your list of reads! Love the book…it seems like the table of contents on page 20 doesn’t match up. We’re there corrections for that? Patty, the TOC is on Page 4&5. Page 20 is the “Choose your own Adventure” where you pick an adventure and turn to the page to find out what location it is in. Do you see any of the adventures that don’t match up to the correct page? Also, a HUGE thank you for your love of the book. We could not be more proud to have readers like you!!!! Just got your book in my stocking for Christmas and have already finished it! Loved it- can’t wait to try out some of the recommended adventures!